Notice in the picture above, the 15 watt panels are physically larger than the 40 watt ones. They are several years older than the new 40 watt "polycrystalline" ones. This seems to be working out ok, but the whole thing is a bit heavy. However, it folds up and packs away nicely. 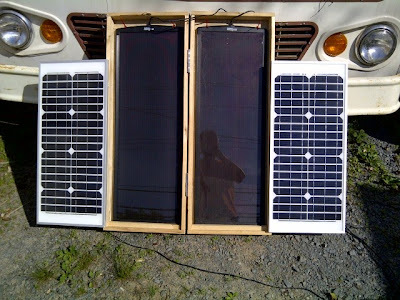 This is all part of my plan for a semi-portable off-grid power setup. These panels, along with 2 Group-27 Deep Cycle Batteries, an inverter, a small gas generator, and a hefty battery charger should make for a good multipurpose Power Station. Fully charged, I'll have about 250 amp-hours of power. That will easily run my fridge for 3 or 4 days. Assuming those 3-4 days include some sunshine, the solar will extend that considerably. Then the gas generator will only be needed as a last resort, i.e. after 4 days of no sun. That's much better than having to rely on a gas generator the minute the power dies.